It was in 1991 that Helsingborg native Jonas and school mate Thomas Öberg founded bob hund – that would soon become one of Sweden’s most creative and acclaimed rock bands. With quirky lyrics in local dialect “skånska” and music inspired by Kraftwerk, Velvet Underground, Pixies, Captain Beefheart, punk and many other influences they soon established a reputation as one of the best live acts in the country. They received Grammies for best rock band (’93), best live act (’94), best lyrics (’96) as well as Guldmicken (’98) when they were voted best live act by Swedish Radio P3 listeners. Since their comeback in 2009, bob hund have released 3 albums, done many gigs to enthusiastic reviews, recorded 24 tracks with only the ending chord for each major and minor key so the listener can imagine the fantastic preceding song, and held a bob hund festival where they auctioned away most of their instruments and old memorabilia. One of Jonas’ missions in bob hund is to inject Kraftwerk influences and eerie blip-blopping synth sounds to balance the otherwise prominent punk and guitar rock approach. Apart from his and Öberg’s project “Sci-Fi Skåne” where they went for a synth based song writing process, Jonas has also been working in the same musical direction on his Huvudwerk project for some years. Some tunes have leaked officially, for instance in the promotional videos from the two times he auctioned his walrus moustache on ebay. Up until now, no Huvudwerk material has been performed live. 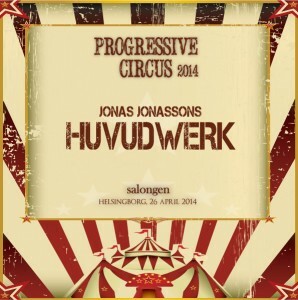 However, at Progressive Circus 2014 that will change, so you better make sure you’ll be there when it happens for the first time, April 26th at Salongen, Helsingborg!! !